Meetings. To a lot of people the simple word provokes a sensation of resignation. And still: meetings are a fundamental part of our everyday team work. This post gives you simple straight forward tips how to run effective meetings. To make sure you have meetings participants will like, it is key to do a series of things before the meeting actually takes place. 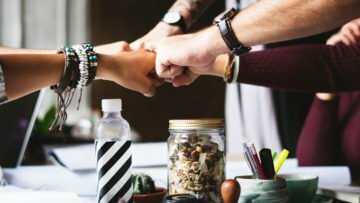 If you stick to the following 6 recommendations, you should be set up for effective team meetings. As long as you are radical enough to apply them rigorously. Really! The more radical you are, the less painful the meeting will be. The laxer you apply these rules for effective meetings, the less efficient the business meeting will be. 1. Is the meeting needed? Though it should be an obvious question, reality suggests that it is not: before sending out any meeting request, ask yourself if the meeting really is necessary. Fact is that a lot of business meetings just shouldn’t take place. The topics should be resolved by quick stand ups or brief four eyes conversations. E.g. if you need someone to take a decision, just walk to the person’s desk and address the topic right away. That’s it. No need for a meeting. If you cannot define the purpose of a meeting, you shouldn’t have it. Having a clear expected outcome sets the fundamental context for effective meetings. Don’t invite people who shouldn’t be there. Make sure everyone in the meeting room is relevant. Any “just in case” attendee is going to lose time attending the meeting, and is very likely going to add inefficiencies to the meeting. In case of doubt, have a quick chat with the person in question. A good rule of thumb for efficient meetings is to have a maximum of 7 participants. With the goal and the attendees in mind, draw a clear meeting agenda to clearly communicate what the good version of your meeting would look like. Include any relevant material or instructions for the attendees in the meeting request. Book the right time to achieve the meeting’s goal. Keep the meeting as short as possible. Tight schedules help people focus on the goal and the essentials. Effective meetings don’t need to last an hour, 25 minutes might be just enough. Think of scrum daily standup meetings: they are short, focus on 3 questions, and achieve a full team update within 15 minutes. Both as attendee and organiser make sure to be prepared. If you attend a meeting without having prepared for it, you will lose your time and make other attendees lose theirs. Consider your own agenda for a moment. 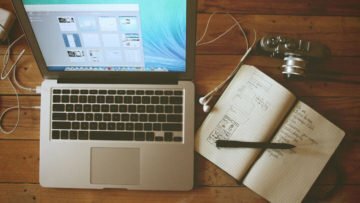 How often do you have colliding meetings without an in-between buffer? It is very likely that all attendees have similar agendas. Thus, make sure to start the meeting on time. And finish latest at the announced time, or if you can before. Putting this agreement in place has two positive side-effects on the long run: people will show up in time and stick to the agenda and focus on the expected outcome of the meeting. Yes, we live in a digital world. So why shouldn’t you write down your notes on a tablet? – Because when you look at your device you are very likely going to be distracted by a notification, an urgent email or recent updates on your Slack stream. If you want to be less radical, put your devices into flight mode before joining the meeting. There are a lot of reasons why meetings can get out of control and turn into boring, slow, unproductive experiences. Even with a fair conductor and a proper setup, a meeting can still tip over. One of the main spoilers is ego< Participants’ egos can spoil meetings, even with the best setup. To make sure this doesn’t happen, put “No ego” on the meeting alliance, and make sure everybody in the room is co-responsible to reveal it, when it shows up. The most powerful antidote against disruptive ego is active listening. Real active listening. Meetings fundamentally are a place to listening and be listened in order to get somewhere, right? Listening actively can be a bit of a challenge, but you can train it: Observe yourself during meetings. When you realise that instead of listing to the speaker you are thinking e.g. how to reply to what is being said, turn your attention back to the person that is speaking. You can build the habit of active listing in a meeting using a ball that gives the right to speak. The participant who has the ball is the only person allowed to speak. He/she decides when to pass the ball to the next speaker. With this tool and the attention of the meeting’s chair, you can make sure all attendees participate and no one dominates the meeting. People expect an specific outcome and are prepared for the specific topic. Not for other topics. Thus, stick to the agreed on agenda and park other topics that pop up during the meeting on a Parking Lot. A parking lot is a simple list on a flip chart or the whiteboard, where you can write down important topics that appear during the meeting. This way they don’t get lost while you keep focussed on the original topic of the meeting. Write down decisions and actions along the meeting, put a due date and the name of the responsible person on each item, and recap the agreements and actions at the end of the meeting. A simple way to do this is by asking every participant to share his/her action items when closing the meeting. To close effective meetings, you need to do two things after it ends: 13. send the memo with the decisions and action items with due dates and responsible person to all attendees right after the meeting. And 14. follow up when agreed on. 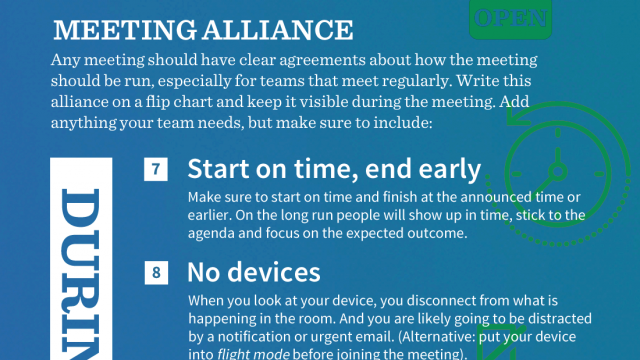 In order to help you put these tips in place easily, you can use this infographic with the tips how to run effective meetings. Download them, share them with your colleagues or circulate the tips for effective meetings to share best practices and convert ineffective meetings into effective ones. If you are interested in digging deeper into the realm of business meeting agendas, team meeting rules and successful meeting guidelines, check this NYTimes article. If you need a hand to achieve effective meetings and productive high-performing team dynamics, drop us a line.